Mexico City’s new mobility law prioritizes alternatives to car transport. Photo by karmacamilleeon/Flickr. Sustainable mobility is a key challenge for city leaders. Mexico City – the world’s fourth most populous city, with more than 20 million inhabitants in its metropolitan area – is no different. The city must overcome a long history of urban sprawl in order to unlock economic opportunities and improve quality of life for residents. The city has made considerable strides in improving sustainable mobility options in the last decade by restricting the use of private cars and expanding metro lines. It has also created the Metrobús bus rapid transit (BRT) system, the ECOBICI public bike-share system, zero emissions corridors, and pedestrianized thoroughfares. While these measures have improved sustainable mobility options and air quality within the city, they are still not enough to meet the mobility targets set by the city’s 2002 transport and roadways law. The mobility law recognizes mobility as a fundamental right of Mexico City residents. As such, the law prioritizes including citizens in the planning, regulation, and managing processes of the mobility system. 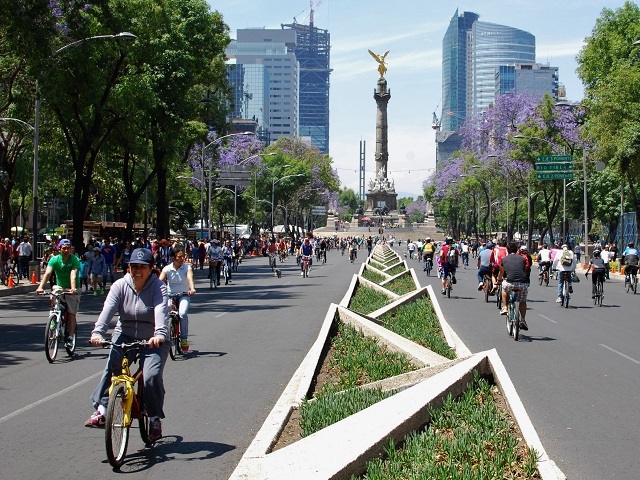 To meet this ambitious promise, Mexico City’s leaders are taking a holistic approach to changing the city’s mobility systems, incorporating principles of urban resilience, inclusive governance, and active transport. The law establishes a mobility hierarchy that shapes the city’s priorities for road use planning and budget allocation. Pedestrians are at the top of the pyramid, followed by cyclists, public transport users, and providers of transport. Owners of private cars are at the bottom of the hierarchy. Through this hierarchy, the law prioritizes people-oriented transport policies such as the promotion of complete streets, safe crossroads, and increased public bicycling infrastructure. Another important change is the consolidation of multiple transport operators within the city, eliminating the “one-man, one-bus” operating scheme. In past years, operators of different bus, metro, or BRT systems were fragmented and did not communicate with one another, preventing users from efficiently transferring from one system to another to reach their destinations. The new law establishes the groundwork for the creation of a regulatory body for mass transit corridors and transport operators, bringing more cohesion to overall transport systems in the city. This regulatory body, to be up and running by January 2015, will also be charged with protecting citizens’ rights to high-quality public transport and helping public transport services to become more efficient, safe, and inclusive. For example, citizens will be able to use a single means of payment for different modes, making transport journeys easier to plan, safer, and giving the city a stronger transit identity. The new regulatory body will also establish and enforce standards for the quality, safety, and timeliness of transport services. Finally, the law creates a new Road Safety Integrated Plan to improve traffic safety throughout the city. The measure focuses on saving lives by prioritizing improved safety for pedestrians and cyclists through improvements to infrastructure design and increased road safety regulations. For example, the law creates additional regulations for driving licenses or permits. The law also places an emphasis on resilience to extreme weather events, holding that mobility systems must be able to respond quickly, efficiently, and at little or no cost to the citizen in the event of a disruption. In recent years, climate change has increased the risk for floods and mudslides in Mexico City, threatening damage to infrastructure, disrupting residents’ lives, and causing economic losses. A more resilient mobility system will help Mexico City respond to these challenges, while emphasizing public and non-motorized transport will also reduce its contribution to climate change by lowering greenhouse gas (GHG) emissions. Mexico City’s mobility law includes a number of features that transform urban mobility in the city and foster a culture of sustainable transport instead of car travel. Though the government still faces a number of challenges during the law’s implementation, the new institutional framework and priority on human-centered mobility helps Mexico City move closer to becoming a leader in urban mobility policy. A version of this article originally appeared in Spanish in Forbes México. Learn more about EMBARQ Mexico’s contributions to the new mobility law here.